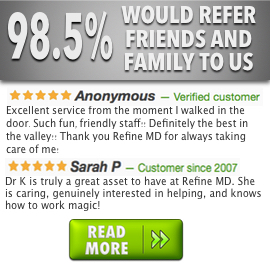 Feel confident that at Refine MD, your providers have had extensive laser training and experience and have met rigorous standards to offer you the safest, most effective treatment. Skin conditions such as wrinkles, scars, acne scars, laxity, keratoses, or pigmentary problems have been very successfully treated with the ProFractionalTM procedure. ProFractional Laser is a laser procedure with little to no downtime, used for improving the overall appearance of your skin. This treatment uses a laser micro beam to treat thousands of pinpoint areas of your skin. And because only a fraction of the skin is directly treated with the laser, healing time is quick and downtime is short. ProFractional Laser uses laser energy to create thousands of microscopic channels in the skin which are surrounded by areas of healthy, untreated skin. The zones of untreated skin invigorate the body’s natural healing process, and the treated areas stimulate production of new collagen, plumping up the skin and smoothing out wrinkles, lines, scars and other irregularities. Who should consider the treatment? If you are looking for younger looking skin, or to improve scars, wrinkles, or sun damage in a comfortable treatment with a fast recovery, then you may be an ideal candidate. ProFractional Laser is a fast, comfortable procedure done in our office. The procedure normally takes 30-45 minutes depending on the condition and the size of the area treated. ProFractional Laser is typically done in a series of 1-4 treatments, spaced 4-8 weeks apart, depending on your needs. Our Physicians will personalize a treatment plan based on the level of improvement you desire. You may also combine this treatment with a MicroLaserPeel or other popular aesthetic procedures to further enhance your treatment results. Immediately following the procedure you will experience redness, resembling a light sunburn, and mild swelling is expected. Complete healing takes anywhere from 1-3 days depending on the depth of the procedure. Most patients can get back to work and apply make-up within 1-2 days after the treatment. What special aftercare treatment will I need?